The new programmable thermostat with touch screen and large display by GECA can be programmed and managed with a simple free smartphone application. It can be installed on a recessed box with 2 or 3 modules. Powered with 230V, it provides constantly updated information about the heating or cooling system, and allows the user to check its status and settings in a simple, intuitive way. The app, which can be used to manage more than one programmable thermostat at the same time from the same smartphone, allows the user to turn the heating/cooling systems on and off, program their weekly functions, switch to manual mode, set the antifreeze function and activate, if needed, threshold alarms for set temperatures. Digital touch screen chronothermostat with backlight display. Easy to install on 3 moulding box or wall. 230Vac - 50Hz powered, it has a double operation modes (summer and winter) in order to command conditioning or heating systems. Simply touch the surface of the display to activate the back light and to show the icons of command that allow to vary the settings and to activate the lock function. Gecapp Crono Wi-fi offers a "antifreeze" program that preserves the system also with the chronothermostat off (temperature lower than 5°C). Can be equipped with an optional 4 mt probe for remote temperature detection. GecApp Crono has a second relay that allows you to replicate the status of the chronotermostat on other thermostats or chronothermostats present in the home or to enable / disable external devices and / or systems. GecApp Crono also has a remote contact to which it can be connected; connect an external device to know a specific event, such as opening / closing a valve, an alarm, etc. Digital touch screen chronothermostat with backlight display. Easy to install in a 3 modules box. 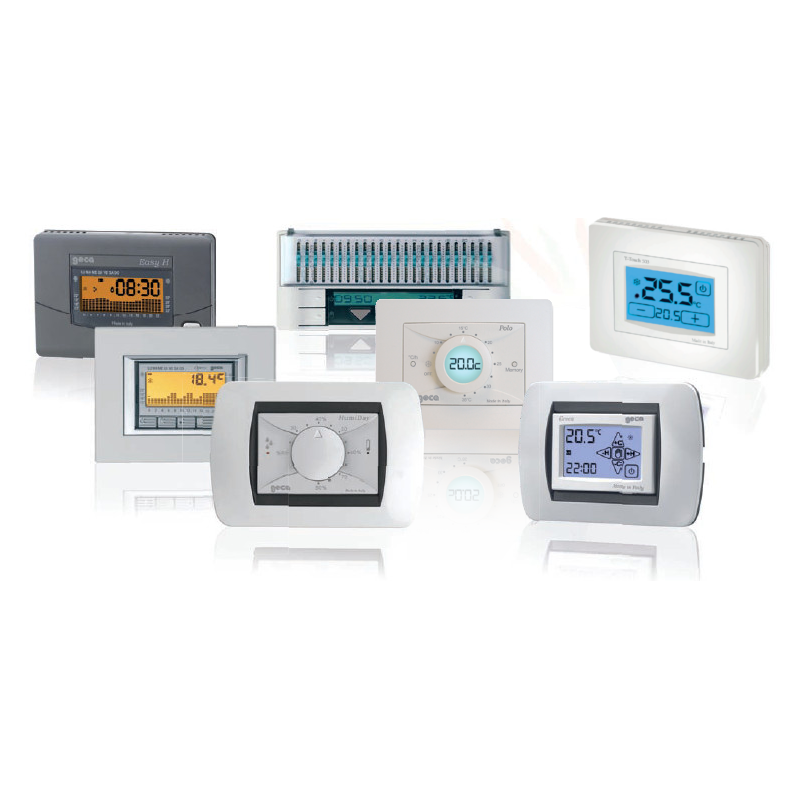 It is interchangeable with DAY and T-TOUCH thermostat and OPERA chronothermostat. 230Vac powered, it has a double operation modes (summer and winter) in order to command conditioning or heating systems. Simply touch the surface of the display to activate the back light and to show the icons of command that allow to vary the settings and to activate the lock function. GREEN offers a "antifreeze" program that preserves the system also with the chronothermostat off, (temperature lower than 5°C). Available with the most popular plates in the market. Digital touch screen chronothermostat with backlight display. Easy to install on 3 moulding box or wall. 230Vac - 50Hz powered, it has a double operation modes (summer and winter) in order to command conditioning or heating systems. Simply touch the surface of the display to activate the back light and to show the icons of command that allow to vary the settings and to activate the lock function. Gecapp Crono Wi-fi offers a "antifreeze" program that preserves the system also with the chronothermostat off (temperature lower than 5°C). Can be equipped with an optional 4 mt probe for remote temperature detection. GecApp Crono has a second relay that allows you to replicate the status of the chronotermostat on other thermostats or chronothermostats present in the home or to enable / disable external devices and / or systems. GecApp Crono also has a remote contact to which it can be connected; connect an external device to know a specific event, such as opening / closing a valve, an alarm, etc. If you do not have a smartphone, you can still handle the GECApp Crono via sms. GSM controller that allows to enable or disable remote equipment (boilers, thermostats, fan coils, air conditioners, alarm systems, gates, etc.) through a simple SMS or a ringing telephone. The GSM 03 activator is equipped with output relay and two alarm inputs, for immediate notification to, for example, boiler block, blackout, or alarm system intervention (theft, gas, fire), etc..